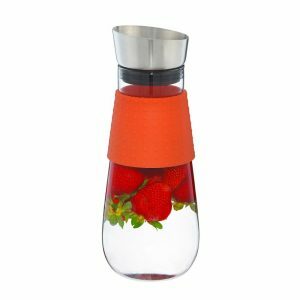 A bold and modern water pitcher and fruit infuser featuring a gravity stainless steel lid and high quality glass. The GROSCHE MAUI is a bold and modern fruit infusion glass water pitcher. It features high quality glass and a silicone grip band, which makes it easy to pour. Moreover, the stainless-steel gravity lid keeps fruit from passing through into your glass. Infuse any kind of fruit you’d like to prepare a refreshing and flavourful thirst quencher. Did we mention it’s also the perfect pitcher for sangria? The MAUI water pitcher is made of high quality heat proof, BPA-free and phthalate-free borosilicate glass. The dishwasher-safe premium decanter-style beaker is handmade by artisan glassblowers. The flavour neutral glass pitcher allows you to see completely through it making it a great centre piece to any kitchen table. The brushed stainless steel lid keeps your fruit inside the water pitcher even when pouring. Simply place your fruit in the pitcher, add your water, put on the lid and let it infuse. Once it’s ready to serve, tip the pitcher and the gravity lid will automatically open, allowing the infused water to pour through. The self-closing seal will then close when pouring is finished. Best part, no fruit passes through. With your purchase of this product, GROSCHE is able to provide 50+ days of safe drinking water to someone in need. GROSCHE is a Social Enterprise and certified B Corp, which is the highest certification for businesses that share a mission to do good for the world.